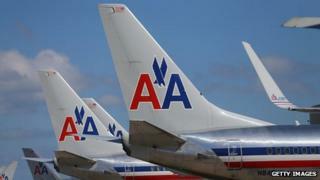 American Airlines and US Airways have completed their long awaited merger to create the world's biggest airline. It follows AMR Corporation, the parent company of American Airlines, emerging from its 2011 bankruptcy filing. Shares in the new company soared after making their debut on the Nasdaq exchange under the stock symbol AAL. The merger had previously been blocked by the US Justice Department (DOJ) over concerns about competition in the sector. "Our people, our customers and the communities we serve around the world have been anticipating the arrival of the new American," said new boss Doug Parker. Mr Parker had previously been the head of US Airways. "We are taking the best of both US Airways and American Airlines to create a formidable competitor, better positioned to deliver for all of our stakeholders. We look forward to integrating our companies quickly and efficiently so the significant benefits of the merger can be realised." The two companies say they expect to save more than $1bn in synergies with the merger. The new airline, which will be known as American Airlines, will provide nearly 6,700 daily flights to more than 330 destinations in more than 50 countries. It will have a combined workforce of over 100,000 employees. As part of the merger settlement with the DOJ announced in November, both US Airways and American Airlines agreed to give up several hundred slots at airports across the US. Those slots were intended for low-cost carriers such as JetBlue and Southwest Airlines, in order to keep prices low for consumers who might be hurt by the increasing consolidation in the US airline industry. Analysts cheered the news, noting that this was the final merger in a long series. Now, there are three main US carriers: United, Delta, and American. "With the merger of American Airlines and US Airways the long cycle of US industry reconstruction began in 1979 with deregulation is now complete," Nexa Capital's Ray Neidl told the BBC. "The public, as well as investors, will benefit from a financially strong industry which can now invest to keep its product updated and in international markets competitive with foreign carriers."